Our first talk addresses the risks associated with the 3D petroleum systems around the recently discovered Johan Sverdrup hydrocarbon accumulation, which is linked to basement horst structures in the Norwegian North Sea, the Utsira High. A probabilistic modelling approach was chosen to account for the geological uncertainties and to allow for an objective risking and evaluation of remaining undrilled exploration targets in the area. The stochastic simulations were performed using a Monte Carlo approach, where many independent simulations of the full 3D petroleum charge model are run and afterwards post-processed to compile probability distributions for the modelling results. One of the key results from the migration modelling runs are maps of hydrocarbon migration through time. The results from the Utsira High migration modelling study are presented using different types of probabilistic migration and risk maps. These migration risk maps give a good match to the known major fields and discoveries in the area. Some structures that have not yet been tested also show a high probability of charge in the migration model. Our presentation “Probabilistic Hydrocarbon Migration Modelling in the Utsira High Area, Norwegian North Sea” will be given in Theme 3 Geochemistry/Petroleum Systems: Risk Quantification Through Petroleum System Analysis Session on Tuesday, April 4 at 1:40 pm (room 370). 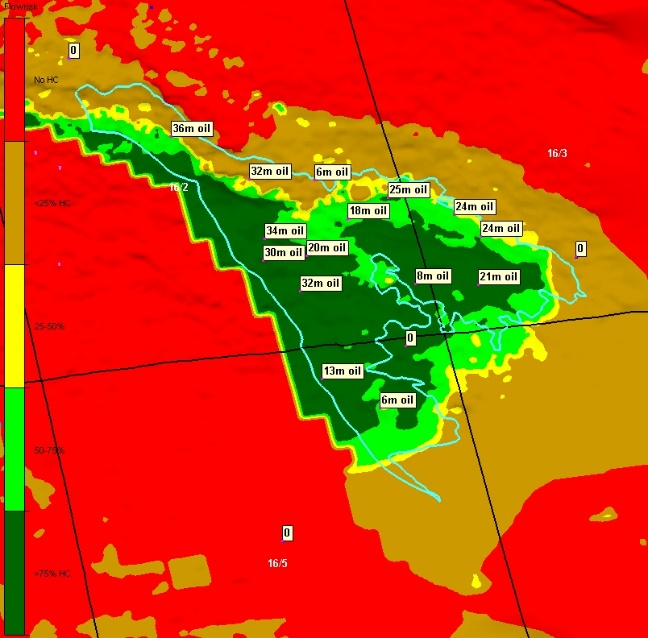 Risk map showing the probability of hydrocarbon accumulation and migration in the vicinity of the Johan Sverdrup structure at present day. Superimposed are the modelled oil column heights across the structure. Image displays modelled hydrocarbon migration patterns at different depth horizons in the 3D model. The Johan Sverdrup discovery is outlined in centred map. Our second contribution presents a methodical concept which Migris is developing during its participation in the NORCRUST research project. 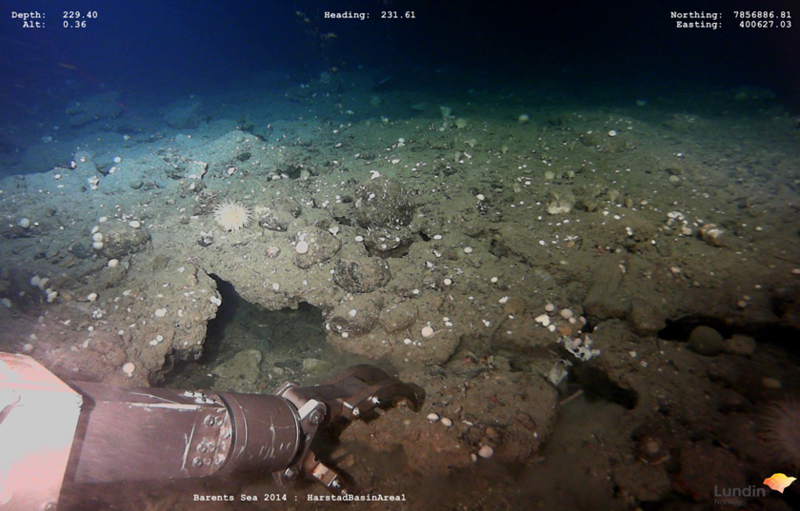 Seafloor methane seepage sites are a global phenomenon which often are characterised by morphologies such as mounds and pockmarks and frequently are associated with gas hydrate occurrences. 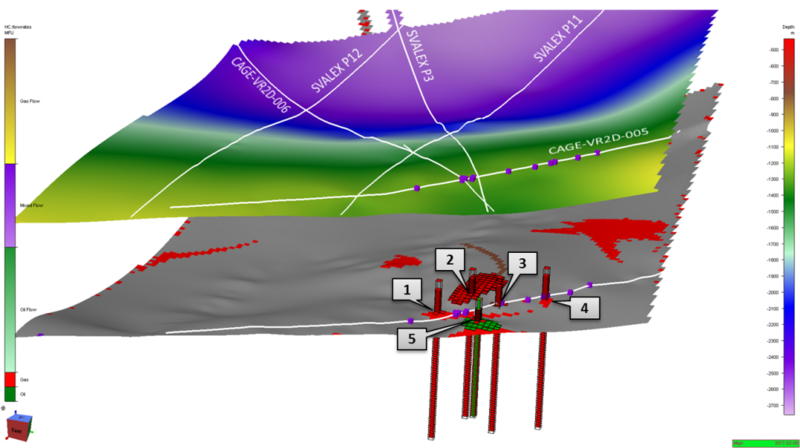 The Vestnesa Ridge is such a gas hydrate and associated seepage system offshore West of Svalbard, for which Migris has been conducting hydrocarbon migration and leakage modelling. This modelling indicates that the active seepage site, located on > 5 km thick sedimentary drift, is mostly sustained by a Miocene thermogenic methane source, possibly feeding the system for > 2 million years. Migris will present a novel stochastic basin model setup that elaborates further on our modelling efforts by linking in new P-cable 3D seismic data to significantly increase the tectono-stratigraphic model resolution. Ground truth input from gas and MDAC isotopic and pore water geochemical data at seep sites are used for model verification. These empirical data are employed as model calibration points to determine the timing and rates of gas escape from the seafloor as well as the methane generation regime and the paleo-hydrate and seepage settings. By reconstructing a petroleum system that jointly honours leakage history input from high resolution seismic data, gas hydrate dynamics at geological time scales and rigorous exploitation of seepage site ground truth data, we aim to enforce a new, temporal calibration domain on the model. Our presentation “Source to Seep – A novel calibration domain concept for petroleum system models” will be given in Theme 3 Geochemistry/Petroleum Systems: New Technologies and Workflows in Geochemistry and Basin Modeling Session on Monday, April 3 at 8:05 am (room 342). 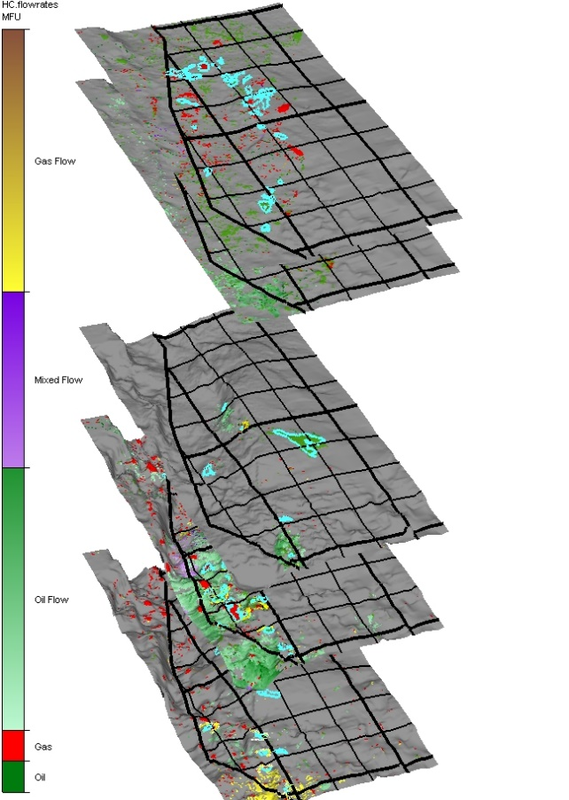 Image shows five hydrocarbon accumulations, their leakage areas and hydrocarbon phase contents modelled to cluster below the methane seepage sites (violet spots) along strike of the Vestnesa Ridge. Superimposed are seismic lines used in the model in white colour. We will be available at the conference to answer questions and provide information on our software and services. Certainly, we are happy to arrange for presentation of our modelling technology at your premises during the conference period until Thursday, April 6th.